Our annual Legislative Scorecard highlights significant bills and establishes a record of how children and families faired during the most recent session. The scorecard shows which State Senators scored a perfect 100%, who had a failing grade and everyone in between. 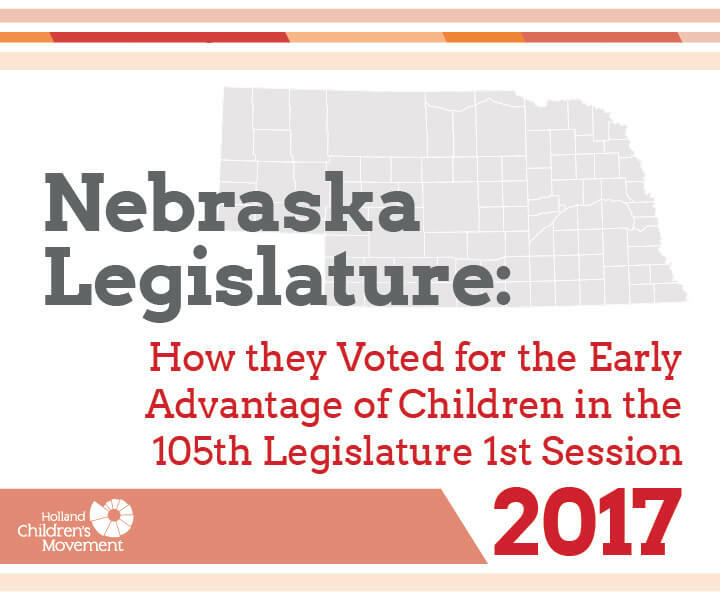 We are pleased to report that nearly half of Nebraska State Senators voted in support of the position of the Holland Children’t Movement 83% or more of the time. Twenty senators scored a 100% in support of children and families this year! Senator Crawford introduced Paid Family Medical Leave legislation (LB 305) that is still in play. The School Readiness Tax Credits were almost frozen, but were saved during the committee process. Senator Walz introduced a new idea to move Nebraska toward Pre-K expansion. Senator Sara Howard introduced a comprehensive study of the Child Care and Development Block Grant Act of 2014 and related state law and policy (LR 156). Check out the scorecard and share it with your networks. Find your Senator. Thank them for supporting children and families or reach out to them if you are disappointed in their vote on an issue.